Real estate transactions can “break up” prior to closing for a variety of reasons. The purchaser may receive a refund of his downpayment depending upon the circumstances. 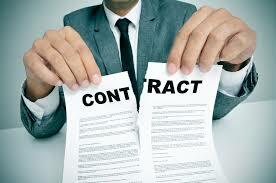 This post will address the legal issues associated with a deal breaking up. Most contracts of sale contain a mortgage contingency clause. Such a provision provides that if the purchaser applies in good faith for the loan and supplies all information reasonably requested by the lender within the timeframe required by the contract, but is declined for the loan for any reason, the downpayment will be refunded to the purchaser. Readers should also be aware that the buyer may have a loan commitment, but the lender may not have cleared all closing conditions and ultimately may refuse to fund the loan. This situation may also give rise to the buyer’s right to the refund of the downpayment. In a contract without a mortgage contingency clause, the purchaser may be subject to the loss of his downpayment if he does not obtain the necessary funds to close. A qualified attorney should monitor her client, by entering the pertinent dates in a calendar and to request extensions of applicable deadlines should her client not have the loan commitment in the timeframe required by the contract. Contracts pertaining to cooperative apartments typically contain a condition that the approval of the cooperative’s board of directors to the transaction must be obtained prior to closing. As in a standard mortgage contingency clause, the contract provides for the delivery of the board application package by a particular date, usually ten business days after the fully executed contract is delivered to the buyer’s attorney or ten days after the loan commitment is obtained. Should the board reject the purchaser, the downpayment must be refunded. However, if the buyer missed deadlines for the submission of the package or intentionally failed his appearance in the board interview, the downpayment may potentially be withheld. Title defects may also cause a closing to break up. Most contracts require the delivery of clean title at closing. Clean title means that liens (such as mortgages of record) and encumbrances (such as an unexpected easement) are to be removed as of closing. Further, clean title requires that there be no judgments of record and that real estate taxes are paid to the date of closing. If the seller cannot successfully arrange for the removal of a title concern, the buyer is not required to proceed to closing and will be entitled to the refund of his downpayment. Some contracts limit the seller’s monetary contribution required to resolve a title issue. For instance, a contract may specify that the seller only needs to spend up to $1,000 to cure a title defect. However, a neighbor may request more than $1,000 to agree to enter an agreement concerning a dispute over a shared driveway. In this instance, the seller is not required to pay more than $1,000 and can cancel the contract, refunding the downpayment to the purchaser. Appraisal results may also cause the cancellation of a transaction. Many contracts provide that a loan commitment is not firm if the appraisal results are not satisfactory, meaning determined valuation of at least the purchase price indicated in the contract. Should the appraisal results be lower than the purchase price, the buyer may be able to cancel the contract and receive a refund of his downpayment. Otherwise, to keep the transaction alive, the seller could reduce the purchase price to the figure consistent with the appraisal results. It is customary for the seller’s attorney to hold the downpayment in escrow until the transaction closes or breaks up prior to closing. If the transaction breaks up, the downpayment should be refunded to the seller or the buyer, depending upon the circumstances. Once the downpayment is refunded, the transaction is deemed null and void, with neither party having any rights or obligations as to the other party. Upon the termination of the contract, the seller is permitted to show the property to other potential purchasers and to enter a new contract of sale. We look forward to advising you in this topic.